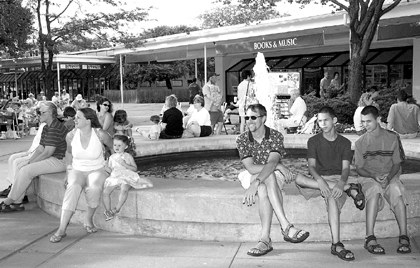 AROUND THE FOUNTAIN: Cooling off to the blues, concertgoers with fountainside seats enjoy the outdoor sounds of Ron Kramer and the Hurricanes at last Thursday's Princeton Shopping Center concert. For the second year in a row, Princeton Township has approved the use of limited bowhunting as a method of deer control in Township-owned properties. As the Borough continually looks for more areas of affordable housing in Princeton, one historic building in town will soon provide the answer for some John-Witherspoon residents. An on-going problem for residents and drivers around the Princeton High School neighborhood was addressed last night as Township Committee unanimously approved an ordinance that specifically targets the parking enigma in that area.